Will Weak Dollar Save Gold? Trade wars and lax fiscal policy are negative for the US dollar and positive for gold. Myth or fact? The chart does not lie. The US Congress widened the fiscal deficit, while President Trump engaged in trade disputes. 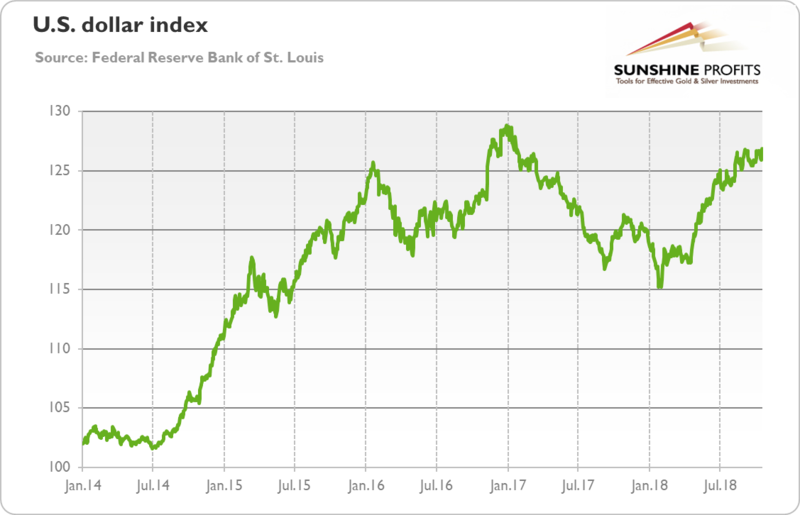 But despite these disturbing developments for long-run economic health, the broad trade weighted US dollar index increased from 115 to almost 130 now. But why – shouldn’t it decline? Chart 1: Trade Weighted U.S. Dollar Index against broad range of currencies from January 2014 to October 2018. Not necessarily. The first reason is the American monetary policy. It might be just a coincidence, but in February 2018, Jerome Powell took reins at the Fed. The US central bank has been gradually raising the federal funds rate, putting the upward pressure on the greenback. Moreover, the new composition of the FOMC under a fresh leadership has been signaling a more hawkish tone, which lifted a market expectations of the future path of interest rates, also contributing to the dollar’s strength. What is really important here is not the mere increase in interest rates, but the upsurge in relation to other economies. The chart below displays the difference between US and German 10-year government bonds. As one can see, the yield gap has widened since the mid-2017. Chart 2: The 10-year Treasury Yield Divergence between US and Germany from January 2017 and September 2018. The divergence in bond yields – which results from the fact that the US recovered from the Great Recession earlier pushing the Fed to adopt a more hawkish stance compared to the ECB – is a key here. Higher interest rates in the US attract international investors who can earn more money thanks to investing in relatively high-yield US assets. And to buy them, they need – yes, you guessed it – the American currency. Hence, less accommodative Fed than its peers strengthens the greenback, making gold struggle.